Several factors determine the appearance of our face. However, skin quality and facial structure are the two broad categories under which description of our faces fall. Texture, color, and elasticity are all important aspects of skin quality. The youthful models on the covers of magazines and on TV excel in all of these categories and consequently set the standard by which we judge ourselves. As we pass from youth, through adolescence and into adulthood, fairly or not, we continue to seek that youthful skin we once had. One of the most indicative attributes of a youthful face is the texture of the skin itself. Young skin has small pores, a smooth texture, a soft feel and is virtually free of any bumps or irregularities. As we progress in age, the pores enlarge and tiny lines eventually develop into distinct wrinkles. The skin becomes thinner which takes away that youthful softness and various bumps, pits and growths appear. The color of our skin, largely due to sun damage, can also develop irregular patterns and lack of uniformity. Hormonal changes and pregnancy can also affect skin pigmentation. Probably the most detrimental aspect of our aging face is the loss of elasticity. The skin and other tissues become redundant. We get “extra” skin somehow. This all stems from the loss of elasticity that we once had. Gravity is the chief culprit affecting the structure of the face. In the midline of the face, particularly on the nose and the upper and lower lips, the skin of the face stays fairly well attached to the underlying bony structures. However, in other areas such as the forehead and cheeks this is not the case. In these areas, the skin is not as well attached to the bone, and therefore tends to begin the slide earlier. 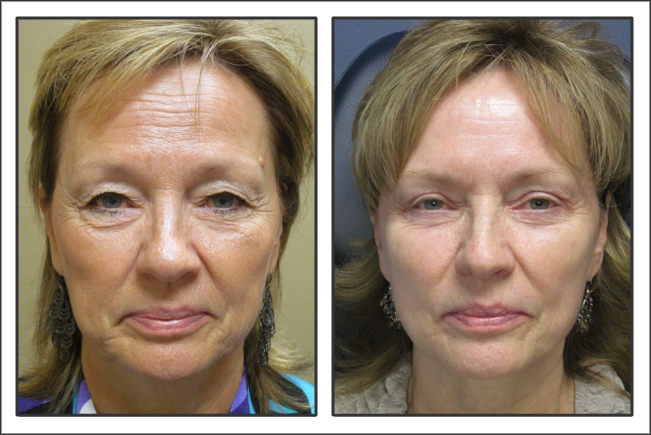 As the cheeks fall downward, they create the deep lines to the side of the nose and mouth (The nasolabial folds) as well as the jowls, which sag below the jaw line. The sagging forehead often causes heaviness of the eyelids and can give an angry appearance to the face. Dr. Sanderson considers these factors and others in evaluating each patient’s facial needs. There is a wide spectrum of available treatment modalities and each person has different needs and goals. Therefore a personalized solution is always necessary. For skin quality issues, especially those of mild pigmentation problems, a good quality skin care regimen can be enough to improve a patient’s condition. Such skin care will also help prevent rapid aging and can therefore postpone the need for surgical intervention. More developed problems such as fine lines or deep rooted pigmentation issues may require the use of a mild chemical peel, and may even require regular treatments to keep in check. Once the skin quality has reached the point of significant wrinkles or irregularities, Dr. Sanderson will often recommend the Carbon Dioxide Laser Resurfacing (CO2 Resurfacing). Laser resurfacing can actually restore the skin texture, color and quality to a more youthful appearance. Furthermore, laser resurfacing with the CO2 laser has been shown to actually tighten the skin by increasing the amount of elastic tissue and collagen! BOTOX™ can be used to temporarily weaken overactive facial muscles if they are the cause of wrinkles. Also, Dr. Sanderson uses dermal fillers such as Juvederm™ to temporarily fill deep lines or folds to give the appearance of tighter skin. Though these measures are only temporary, they offer a short term remedy in certain patients and with less downtime than surgery. Despite often outlandish claims by some marketing companies, there are no quick and easy fixes problems related to structural components of the face. Correction sometimes requires surgical intervention. While surgery of the face is not to be taken lightly, it can be done with a reasonable amount of down time and minimal discomfort. 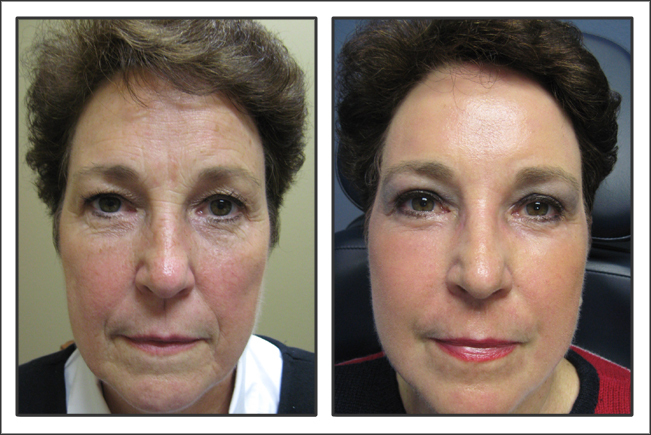 Dr. Sanderson uses a variety of options to restore the position of aging facial skin and structures. 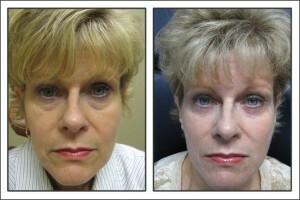 Below are some unretouched photographs of Dr. Sanderson’s “Facelifts” and “Laser Facial Rejuvenation” patients.